A dramatic sunset sends light streaking across the surface of George Lake at day's end. 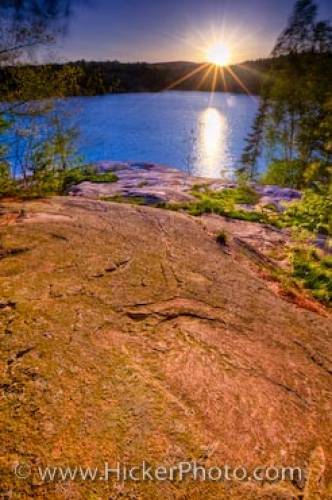 A lake surrounded by the ancient smoothed rocks typical of the Canadian Shield, George Lake in Killarney Provincial Park of Ontario attracts visitors from near and far and is a popular recreational lake. Sunset over Killarney Provincial Park, Ontario, Canada. in Killarney Provincial Park, Ontario, Canada.